MSY Damai is a new luxury Indonesian liveaboard launched in October 2009 by Alberto Reija, who previously worked on MSY Seahorse and Kararu liveaboards. Damai (the word is Indonesian for “peaceful”) is trying to do something pretty ambitious with the liveaboard concept, by targetting small groups of underwater photographers who want a top-level luxury boat that is super focussed on their requirements. 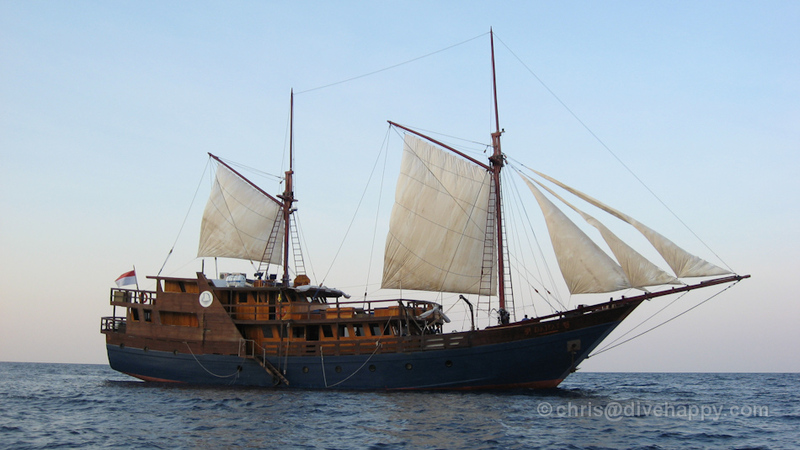 I joined the boat on its 5th and 6th trips during November 2009 as it sailed through Komodo, the Banda Sea and Raja Ampat – after four weeks on board, here’s my rundown of what the MSY Damai is like as a diving liveaboard. Perhaps the most radical move is the limit on the number of guests: MSY Damai carries a maximum of eight guests on each trip, split between 4 huge stateroom style bedrooms. (There’s also a more modest cabin for an extra 2 people, usually tour leaders who have chartered the boat for a group). These cabins are the biggest I’ve seen on any boat – they are each 300 square feet. There’s more info and videos below. There are three dive guides on board, so there’s at most three divers to one dive guide. The whole boat’s setup revolves around looking after the needs of underwater photographers, from a custom built spacious camera room and individual rinse tanks at each dive gearup station to extremely proactive boat staff who handle camera gear with skill and sensitivity. There is also a Cruise Director on board – this is either the boat owner Alberto or Lorenzo, an Italian guy who is endlessly cheerful – even at 5.30 in the morning – and also hyper-organised at keeping the boat running smoothly with the 15 crew on board. He also has some fantastic stories to tell at the dinner table (be sure to ask him about the Teletubbies). Lorenzo and Alberto frequently dive with the guests as well, so providing another pair of eyes in the water to assist the dive guides. Each cabin has two desks for photo editing, complete with power outlets and overhead light. These means that each guest can review and edit in the privacy of their cabin if they prefer and have plenty of space. This is a very nice touch for photographers, as they can leave their laptop set up and ready to download each dive as they wish. Included in Damai’s price is usage of 5mm wetsuits for colder water dives, like at Cannibal Rock in Komodo, and there is a spare camera and video camera on board in case of problems with your own. More info on the spare camera below. Some of these things may seem too subtle to be particularly noteworthy – but if you’ve ever been on a liveaboard where there’s too many guests, too few staff, too little effort made to look after your camera gear and too few opportunities to find stuff underwater because you’re constantly stuck in a swarm of six divers, then you’ll appreciate MSY Damai’s setup. Besides the photography angle, MSY Damai provides truly impressive bedrooms (more info on the rooms below) along with very attentive waiting staff , great quality food and an all-inclusive policy of unlimited beer and wine are included in the trip price. The wait staff were very accommodating to all requests – it’s a similar concept to Peter Hughes boats that I’ve been on previously. (More info on Dining and Drinking below). Inevitably, Damai charges a premium over other liveaboards in Indonesia for its services, so it’s important to weigh up if the extra benefits of the boat – less guests, much more space, maximum 3 to 1 dive guides, dedicated camera gear set up, luxury service – is worth it to you. If you check Damai’s schedule for the next couple of years on their website, you’ll see that they have numerous charters from some of the biggest names in underwater photography. Clearly this is Damai’s target audience which needs to be sufficiently impressed not only with their first trip but to return to Damai and be happy to pay the extra trip cost for the difference it makes. MSY Damai has the look of a traditional Indonesian wooden pinisi schooner, but it’s much bigger due to an extra deck and wider beam. The four bedrooms are divided between Rooms 1 and 2 in the lower deck, which each have two king size double beds in them, and Room 3, which occupies the full back of the boat and looks like something out of Pirates of the Caribbean with its four windows in the stern, and Room 4 above which is a little smaller than Room 3 but has its own private stern balcony. Room 3 also gets the most light due to its position and windows on three walls of the cabin. Rooms 3 and 4 have one king size bed in them. Rooms 1 and 2 are designed to accommodate either one couple or two singles, but if shared by singles they both get a king sized bed to themselves. All of the rooms are a minimum of 28 square metres (300 square feet) – they are all, in short, bigger than my apartment at home. In Rooms 1 and 2 there is a toilet and shower in separate rooms, and indeed, a full sized bathtub in the shower room too. There’s one sink in the bedroom itself and two writing desks. Hairdryer and dressing gowns are provided in all rooms. One annoyance is that there is no hand sink in the toilet itself. Rooms 3 and 4 don’t have a bathtub, but have the same amenities as Rooms 1 and 2. Rooms 3 and 4 have their own unique characteristics, as mentioned above. One downside of Room 3, the biggest cabin of all, is that it is directly above the engine room, so when the boat moves early in the morning there is some rattle and hum. Similarly the raising of the anchor can be heard in Room 1. How Does MSY Damai Handle In Rough Seas? One important thing to note is that MSY Damai handles well when doing big ocean crossings, like in the Banda Sea. We had a couple of rough nights out there where the boat was pitching around a fair bit, but it didn’t the boat into a vomit comet. The creaks and groans of the ship’s timbers might be a little more disturbing, but that is standard on wooden boats anywhere. It also helps that Damai’s captain is very experienced and knows how to take on big waves while minimising boat movement. Here are individual video tours of each cabin – nothing fancy, it’s just me walking around with my camera, but it gives you an idea of their size and amenities. All food is served in the mess deck, which is airconditioned and has two fans too. Ironically, the single large dining table is slightly cramped for a full complement of guests plus 2 tour leaders and the cruise director – 11 in all – but it’s not a big deal. The dining table is a natural place for conversations to begin and lets everyone take part. Dining follows the usual liveaboard format – light breakfast before first dive, breakfast after first dive, lunch after second dive, snack after third dive in late afternoon, dinner around 7pm for those not night diving or 8pm for those night diving (or whenever they get back). It’s possible to order food at any other time but in practice is not really that practical to do so if you are keeping to the dive schedule. Guests are asked before each mealtime to confirm if they are happy with the meal menu and substitutions are suggested if not. This all worked fairly seamlessly with the crew able to quickly adapt to requests. Food is served at the table rather than buffet style. There is a heavy duty espresso machine on board for those who want cappuccino. There is unlimited beer, wine and soft drinks included in the price. Currently there are no spirits available on Damai, which might change, but would probably require a separate charge. (Bringing your own is the obvious solution – basic mixers like tonic water can be requested ahead of time, so gin drinkers, take note. Don’t expect any cranberry juice however). Lunch and dinner and three course meals – salad as starter for lunch and soup for dinner. Food is very well presented and in general excellent – I took a couple of photos as random examples of dishes we had. I wish I’d done this on previous liveaboards I’ve been on as I think it helps give an idea of what to expect. Lunch: Starter: Mix salad (carrots, lettuce, tomatoes, bell peppers, onions, eggs, boiled potatoes, raisin) with Thousand Island dressing. Main course: Spaghetti Carbonara (cream, bacon, parmesan cheese, onion, garlic,egg, salt, pepper). Dessert: Fresh fruit (mango). Dinner: Starter: Cauliflower soup. Main course: Roast sweet potatoes with grilled wahoo in leak compote sauce and balsamic vinegar reduction, with green beans and sweet corn. There is a large sundeck with two double bed loungers, four single loungers and two reclining seats located just up from the dive deck in front of the captain’s bridge. The sundeck is usually covered with a canvas sail to provide some shade, as the Indonesian sun is pretty savage. There is a balcony with armchairs at the stern of the top deck too. Massage on the sundeck is available free of charge from Comoran, a qualified male masseuse who also works as one of the wait staff. Several guests (male and female) tried the massage and all said it was very therapeutic for aching shoulders etc. As mentioned above, there are three dive guides between eight guests. The guide leader is Gusti, widely regarded as one of the best dive guides in Indonesia who helped discover many of Komodo’s key dive sites in the early 1990s. Wayan, formerly from Peter Hughes’ Komodo Dancer, and Ketut, formerly from one of Bali’s major dive operators, are also excellent, experienced guides. The dive station is located at the bow of the boat. Each guest has a tank setup station with their own personal camera rinse tank and locker to store smaller items. (The locker is located under the seat of the setup station). Wetsuits are hung up on a rack at the front of the boat. Nitrox is free and guests are requested to analyse their tanks when gearing up. The camera room is located by the dining area. Guests can set up their cameras and then bring them from the camera room to the dive area where there is room for them to be put down before being taken to the tenders. The camera room has eight power stations, one for each guest, with a rack of 110 and 220 volt plugs. There is also a storage cupboard directly underneath each station and also two shelves above for placing lenses, chargers etc. The camera room is great, but it could probably do with being a bit bigger – if you had eight people in there simultaneously it would be pretty cramped. As it was, it worked out Ok with five or six of us in there. There is a continuous supply of camera towels available before and after dives to wipe down gear, keep the sun off and protect ports as necessary. There is also a spare Nikon D200 DSLR camera and video camera on board in case guests have problems with their own equipment. Over our two trips we unfortunately had a couple of breakages and floods and for guests to be able to use the Nikon D200 was a real godsend. There are two boat tenders for three dive groups. Entry into the water is by backroll entry. Starting in 2010 there should be three tenders – for now, two groups go out and drop in and one tender returns for the third group. This is a bit tedious as it means group 3 has to wait around for 10 minutes or so for the tender to come back. The three groups rotate every couple of days. The journey time to dive sites is usually very short – 5 minutes or so. Occasionally it can be around 10 mins. Each guest’s tank, fins and camera are carried by the boat boys from the station to the tender. Guests just need to remember to bring their own mask and computer.Getting onto the tenders uses the standard wooden staircase down to water level – this works well, except for in choppy water. On our last day of diving we had a lot of surge and the tender went straight under the ladder – not fun. This should be rectified in future. The boat boys on each tender are excellent – they are quick to help you gear up, and adept at passing camera gear in and out of the boat quickly without bashing it around. There are boxes on each tender to store dome covers, sunglasses, hats etc. They are also generally very good at keeping clear with the engine propeller switched off when divers are submerging, although there were a couple of occasions where I thought they could have left starting the engine for a little while longer. One major criticism I’d make is that the wooden decks of Damai are very slippy, and there are currently not any handrails along the walkway from the dive setup area to the tender. There are rubber mats on the floor around the dive deck area which help, but guests need to take real care walking to the boat. All your scuba gear is taken for you by the boat boys to the boat before you get on, but care still needs to be taken. It’s hard not to be impressed with MSY Damai – it’s a great boat that has been built to a specific concept, and it’s obviously a gamble for Damai’s owners about whether enough divers will agree with that concept and be prepared to pay the extra money. The response of guests on the two trips I was on was generally very positive. The big challenge for Damai is not only maintaining the high standards it’s set for itself, but also continually improving the boat in the future. Personally, I loved it – the small number of guests, direct help from dive guides finding stuff, and ease of dealing with all your camera gear along with the top notch food and sleeping arrangements meant that 4 weeks on the boat passed very quickly. Bali is the departure point for all Damai trips – not in terms of the boat departure but where a Dive Damai representative will pick up guests from their hotels on the morning of departure and organise their domestic flight to the boat’s departure point within Indonesia. There are numerous international flights to Bali. See Skyscanner and Kayak to compare airline flight prices. (Bali is an excellent dive destination in its own right and deserves a few days at the beginning or end of your trip). Dive Damai reps handle the purchase of all domestic flights and excess baggage charges, but note these are NOT included in the price – flights and excess baggage are billed to each guest at the end of the trip. Domestic Indonesian flights are relatively cheap, around $US 100 to $200 depending on your destination. Purchasing Indonesian domestic flights when not already in Indonesia is an exercise in futility – better to let Dive Damai handle it for you. This goes for any liveaboard in Indonesia. Start Planning Your Indonesia Dive Trip Now! :: Check the availability and pricing of liveaboards in Indonesia and book online. :: Find the cheapest flights to Indonesia - one search will show you the prices and times from scores of airlines for your trip. A real timesaver. :: Get dive and travel insurance for Indonesia from World Nomads - make sure you're covered above and below the water. World Nomads lets you buy insurance online quickly and easily. :: Find available places to stay in Indonesia on Booking.com - usually you can reserve a room with no upfront payment. Pay when you check out. Free cancellations too. :: Need inspiration? See our Best Places To Dive In Indonesia for ideas of where to go and what to do.